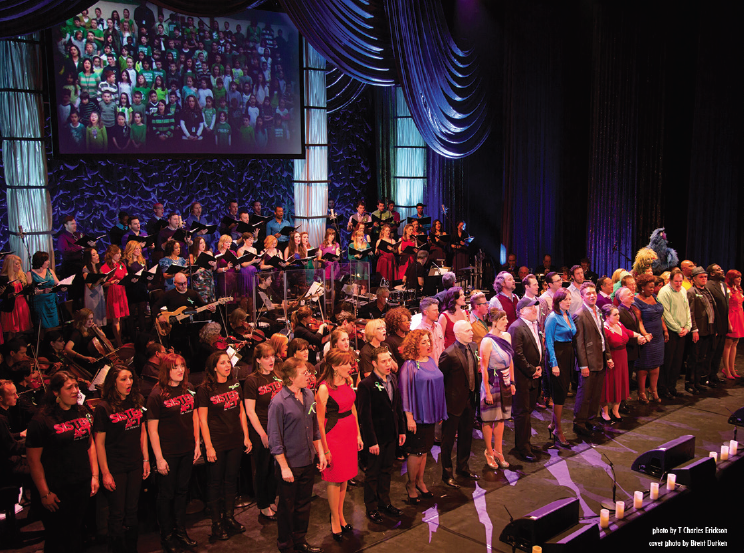 “From Broadway With Love: A Benefit Concert For Sandy Hook” was a concert of healing for the Newtown community that took place last month. 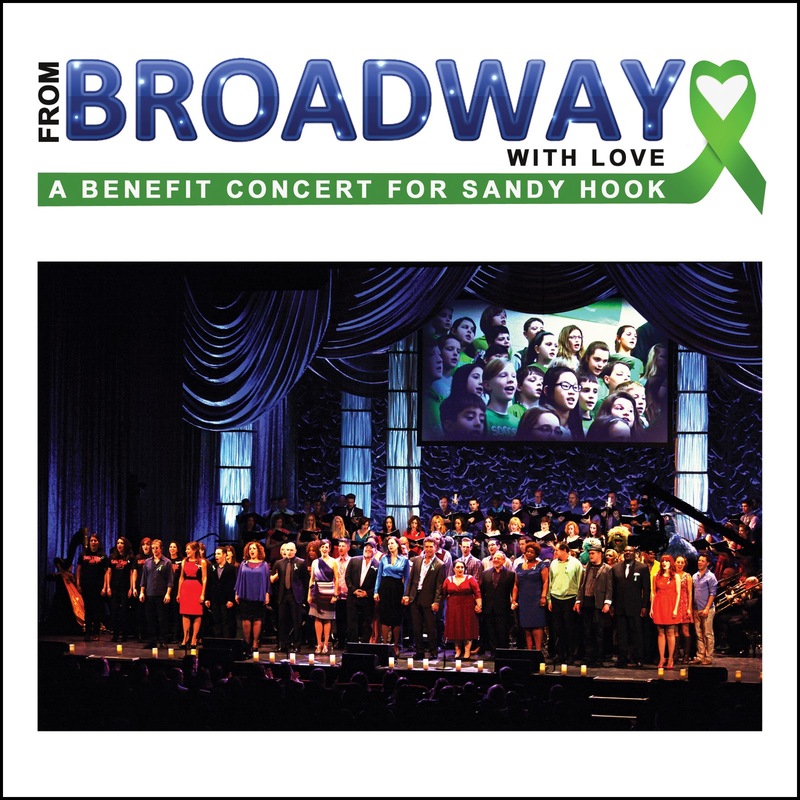 In it composers, musicians and several stars of Broadway came together with over 300 students from several Newtown dance groups, the Sandy Hook Elementary School 3rd and 4th grades (2012/2013 school year) and the Newtown High School Chamber Choir (2012/2013 school year). The result is this live recording, where we can feel the emotion of the artists and the audience. Like all concerts that use material from different sources, I can say there’s something for everyone’s taste. It begins with a quiet, but nice, “Seasons of Love”, that’s followed by composer Stephen Schwartz singing “Beautiful City”. Julia Murney gets a great ovation with “Defying Gravity”, but I think her rendition is too high-pitched for my taste. As you all know, I love old tunes, so it comes as no surprise that for me the highlight of the album is “On the Atchison, Topeka and The Santa Fe” sung with gusto by the great Christine Ebersole. Next, Janet Metz & Richard Kind delivered a funny number from the musical MY FAVORITE YEAR and then Kind gives us “I Wan’na Be Like You” from THE JUNGLE BOOK. An old classic follows, “Ol’ Man River”, strongly sung by Phillip Boykin. I never heard “Still” before and it’s a beautiful melody. Then it’s time for Mary Testa to have a great time with “When You’re Good to Mama” and Michael Cerveris introduces us to Sondheim’s “Finishing the Hat”, with a winning performance of that song, and then leads the chorus with the haunting “Sunday”. WEST SIDE STORY’s “Somewhere” follows and then the cast of SISTER ACT lights up the stage with “Raise Your Voice”. For children of all age, SESAME STREET characters delivers the life affirming “Just One Person” from SNOOPY! THE MUSICAL. Things get rocky when members of the cast of MILLION DOLLAR QUARTET take the stage with three numbers from that musical and Neil Diamond’s “I’m a Believer” follows in the voice of Mickey Dolenz. Then Marc Shaiman introduces his HAIRSPRAY with two songs sung by the perfect Nikki Blonsky (the movies’ Tracy), “Good Morning Baltimore” and the contagious “You Can’t Stop the Beat”. “Sing”, from ALIVE IN THE WORLD, isn’t my kind of thing, but “The Impossible Dream” is one of my favorite songs and Brian Stokes Mitchell sings it superbly. Frank Wildhorn introduces an up-lifting “Finding Wonderland” from WONDERLAND, sung by a terrific Capathia Jenkins. Another song by Wildhorn, “If I Had My Way”, is sung effectively by Linda Eder and it all ends emotionally with Barry Manilow’s “One Voice”. As concert recordings go, this is an interesting one with more than a couple of strong performances and it’s quite enjoyable. One more thing, the profits from sales of this CD (DVD, Blu-ray) will be 100% donated to the Newtown-Sandy Hook Community Foundation.